A steam locomotive has left Centennial Park for the first time in 65 years. 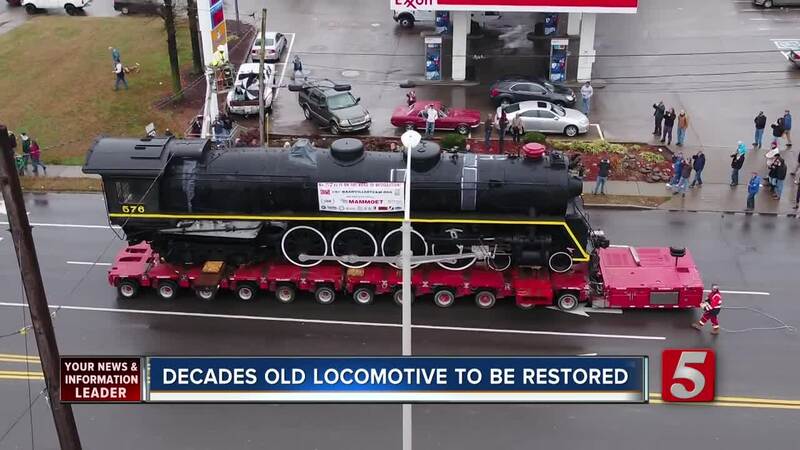 NASHVILLE, Tenn. (WTVF) — A steam locomotive has left Centennial Park for the first time in 65 years. A train enthusiast said it's bittersweet to see it leave. Toy Mason said, "It was deteriorating because of the bird poop and the elements and all that. It needs to be restored, it's the last of its kind." Sunday morning No.576 left the park, moving anything out of its way. Mason said, "That's the only surviving one." People lined the streets to capture the moment. Scott Baxter said, "It's historic... steam locomotives really were the power that built our country." Baxter never thought he'd see this day. Baxter said, "This is a very happy day, it kind of some closure to something I started enjoying when I was very young." It took months of planning to move the train. As the locomotive got closer to the tracks, a family remembered their loved one, Thomas Neale Flanary, who was one of the train's engineers. He helped guide it along the Nashville, Chattanooga, and St. Louis railway. Peggy Orange said, "He would toot the horn as he passed near their house over in Cherokee Park." It will be 3 to 4 years before the train is operational. The Nashville Steam Preservation Society will have to raise $1.5 to 2-million dollars to make that happen. So far, they've raised approximately $750,000 for the restoration project. Their dream is to do excursion trips out of Nashville using the Riverfront station. You can follow updates here.